If you think you have seen a bear, you have. That is what people tell me here in rural Virginia and yes, I have seen a bar (Virginia slang for bear) walk right by my window. Granted, he didn’t know it was my window. He just sauntered on by in all his magnificence as if it were his regular route to our peach trees. Bears are supposedly very shy critters and will avoid meeting up with us humans UNLESS we take them by surprise or come between a mama and her cub. There is at least one other major causative factor leading to human-bear connections, which leads me to a good story. I live in a semi-wilderness area where twelve human families reside in private dwellings in the middle of 300 acres of jointly managed undeveloped land. 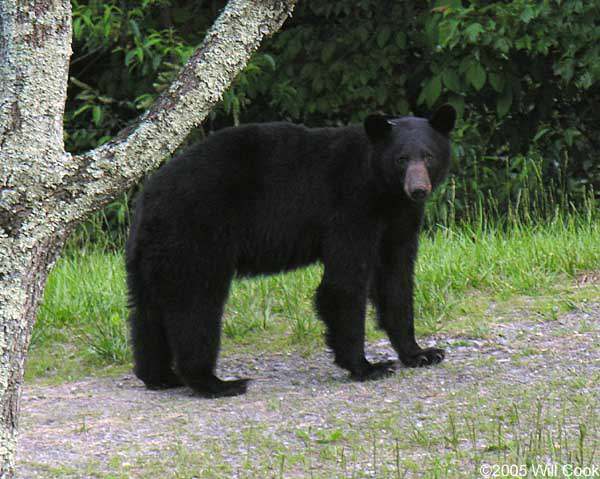 We all know the area is teaming with foxes, ground hogs, squirrels, turkeys, deer, raccoons, possums, and yes, Virginia Black Bears. Every now and then one of my neighbors reports seeing a huge 350 pound bear! This may be a slight exaggeration but could be true too. They do grow to large proportions. If I walk along our country lanes I give warning by shuffling loudly or clapping my hands, or clearing my throat, or shouting at myself. I doubt this will help if a bear decides to attack, but I feel better and I do not care if accidental onlookers think there is a madwoman in the area. HELP! I AM TRAPPED BY A BEAR! My neighbors claimed to be trapped in their home by an enormous bear who was banging on their windows and sliding doors. I have heard numerous versions of the story and have settled on this one. Dinner was delightful and my neighbors, Joan and John (fictional names), had just put away the dishes and settled down to an exciting night of television sitcoms when they heard noises at the window. Looking up, they were stunned to see the face of an enormous black bear looking in and periodically pounding on the glass. 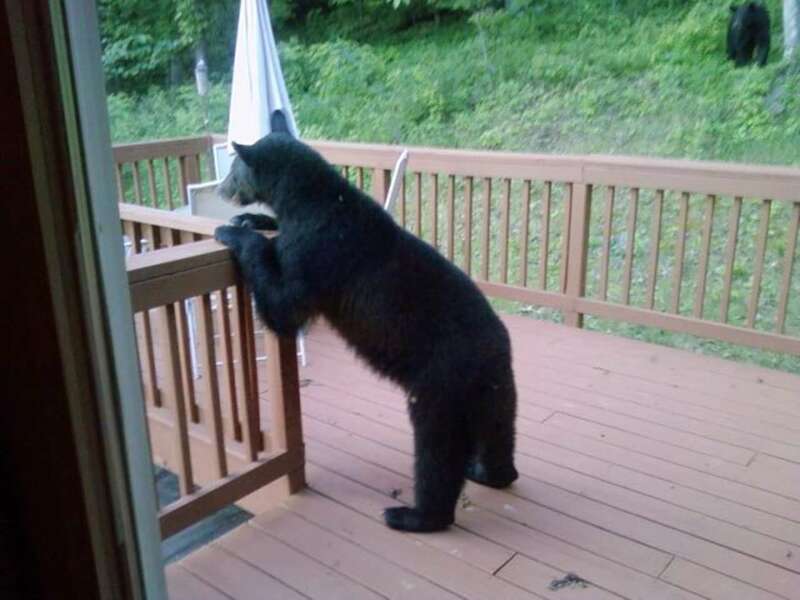 “You mean a bear is out there trying to get into your house”? So, the good sheriff came quickly, but by the time he arrived there was no sign of the bear. Perhaps he (Bruno) had heard the squad car drive up and decided to flee the law even though he had not yet succeeded in breaking and entering. The sheriff tried to calm the couple and promised Animal Control would be out in the morning. But, the sheriff had to leave to cover other dire emergencies like a woman who reported footsteps on her roof. My neighbors returned to their home with great trepidation. Would the bear come back? Why had he chosen their house out of all the others in the community? Should they go to a motel? Would they be plagued by this mammoth creature all night? They decided the danger was over and they went to bed. But, the bear returned and kept scouting around the house for points of entry. Eventually he gave up and around 4 AM Joan and John were able to fall asleep in a closet with no windows. Later that morning, as promised, Animal Control arrived with a very big bear trap. They explained the trap was a humane way to subdue and confine Bruno so they could remove him to an even more remote location. The trap was laced with a big canned ham as bait (taken out of the can of course). The result? The ham just stayed there, the bear never returned, and the couple lost sleep night after night worrying about it. There is a moral to every story, and although this story has been ever so slightly embellished for dramatic effect, there is definitely a moral. DON’T LEAVE THE REMAINS OF EDIBLE GARBAGE OUTSIDE, ESPECIALLY NOT SALMON, BECAUSE IF YOU THINK YOU HAVE SEEN A BEAR, YOU HAVE! *This story is founded in fact. My neighbors were indeed trapped in their home by a bear and wound up calling the local sheriff. And they did leave the remains of a fish dinner in their outside garbage can. Animal Control did come out with a ham-baited bear trap but Bruno never returned. The rest is fiction.